Roy of the Rovers was by far the most popular football comic ever. Running from 1954 to 2001, stories covered various issues—Roy as a teen trying to break into the famed "Melchester Rovers" team, winning every trophy imaginable, representing his country in the World Cup, playing with pop stars and even relegation. He even had an unstoppable shot called the "Racy Rocket"....ah, those were the days. Roy Race made his debut in the Tiger comic in 1954. Tiger was from the same stable as the famed "Eagle Comic" which focused on the science-fiction end of things, with Dan Dare as it's banner character. Tiger was focused on real life, and all of it's stories were based in the "real" world. And this new direction proved to be an instant success. Readers took to football stories like proverbial ducks to water, with Roy of the Rovers becoming one of the most popular stories on the planet—in the '70s sales reached the million mark. Considering the comic was weekly, that is some sales figure. 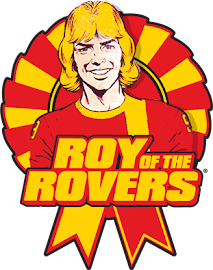 Beginning on September 11th 1954, Roy of the Rovers was the banner storyline in the Tiger Comic. Initially focusing on a teenage Roy as he tried to break into the first team at Melchester Rovers. After a whole year in the youth team (story-lines were slow-burners in those days) Roy eventually made it into Melchester's first team and became a star. Roy won his first honour in 1957 (League Title) and over the next 46 years, it was a rare occasion for Roy to go a season without a trophy. 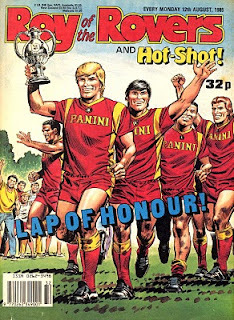 As was expected with most comics of this nature, it focused on the matches and scoring glorious goals against "cheating foreigners" but where Roy of the Rovers differed especially during it's golden period of the 70's and 80's was that it often featured side stories about training methods and the perils of being a footballer and the obstacles they have to overcome. Most sport comics at the time required the reader to make huge assumptions and connect the panels together as the story progressed. The writers of Roy of the Rovers invented a novel method of doing this for the reader, in such a simple way that they didn't even notice it. They had the crowd make comments during the matches. Nothing strange there, but the comments were carefully designed pieces of commentary. As if the reader had John Motson sitting on his shoulder. By adding in lines such as "Race is looking to find Gray with a pass", "The keeper will never save that shot" etc., the commentary moved the story line of the match on with incredible ease. That sometimes these whole paragraphs took place from the time the ball left Roy's boot to when it hit the back of the net never dawned on the average fan, it was all part of the beauty of story-telling. And although the football matches were at the core of the comic, it often branched out in some strange directions. Over the years, storylines saw Roy lapse into a coma after being shot, which was the starting storyline for when Roy eventually flew the Tiger coop and got his own comic, Roy of the Rovers. In a storyline mimicking the famous Who shot J.R.? story, Roy was shot by an actor who played Roy on TV. Over the next couple of weeks the story captured the public's imagination (and mine) and for a short while it became an item that featured on the news as the comic became one of the most popular comics on the planet. The Melchester team were even kidnapped by Arab terrorists, in this storyline the team escaped after being held captive for weeks, only to crash into a terrorist car laden with explosives. Six of the Melchester United side were killed, and the story brought so much condemnation of it's stereotypical portrayal of the Middle-East, that the story-line was never referred to again. This storyline in 1986 signalled the end for Roy, as readership levels began to steadily fall. The players killed in the explosion were replaced by pop-stars Martin and Gary Kemp from Spandau Ballet. Almost every match had a last gasp winner, and with the matches sometimes being stretched over three or four weeks (to keep people buying the comic) the readers began to grow bored. In an attempt to regain high readership levels, the writers tried some other unusual gimmicks. One storyline saw an earthquake in Melchester cause subsidence under the stadium, and being left homeless, Melchester had nowhere to play. Luckily enough a benefactor agreed to let them use Wembley for a season. How the writers thought that Roy Race playing at Wembley would boost figures is anybodies guess. By this stage in 1993, readership levels were at an all time low, and the writers took the decision to curtail the weekly comic and go monthly instead. In another gimmick, other popular football comic stars of the past signed for Melchester. Johnny Dexter "The Hard Man", Hot-Shot Hamish, Kevin "Mighty" Mouse, Billy Dane (Billy's Boots), Rick Stewart (Goalkeeper) and Blackie Gray all became Melchester players in a bid to centralise all the British football comic characters and to try to convince all of their fans to buy "one" comic. The whole history of Melchester Rovers changed too. Roy's 40-year career was shortened to 10 years to make it more realistic. Opposition place names changed too, to mirror this new realism. Melchester didn't play against Everpool or Liverton anymore, the team-names were changed to reflect real areas such as Birkenhead, Toxteth, and Islington. Failing to realise that these real names meant nothing to fans was a huge mistake. Fans knew that the writers couldn't use the real team names but they easily identified with teams like Everpool, Tyne Castle, Liverton, and Melchester. And although the new names reflected a certain realism, fans couldn't identify with them because they didn't know where the areas were or who they represented. In another effort to drum up readership among ethnic minorities, Melchester signed a token Nigerian in 1994, just prior to the World Cup. Del Ntende was nicknamed "Delroy of the Rovers" and featured heavily but the writers attempts at reviving the comic were too little too late. Finally the writers chose to "jump the shark". Roy was on his way to see a prodigious youth play when his helicopter crashed. Over the next few weeks fans all over the world waited with baited breath to see if Roy would survive. He did, but he had to have his trusted left foot amputated, and so ended the playing career of the greatest comic book player ever. How the writers thought that this would save the flagging comic is mind-boggling. Roy moved into management, first with A.C. Monza in Italy but then back to Melchester. But even he couldn't save the comic from finishing. By the end of Roy of the Rovers final season as a comic, Roy had had his foot amputated. Blackie Gray had resigned after receiving death threats from fans, Melchester Rovers were in receivership and were on the verge of going out of business and Roy's son Rocky scored the winning goal in the FA Cup. From the comics demise in 1995, various attempts have been made to bring Roy of the Rovers back from the dead. In 1997, BBC bought the rights to the comic, and they began to feature an on-going storyline in "Match of the Day" magazine. BBC ran the comic strip until 2001, when they decided that the time was right for Roy to retire for good. Roy of the Rovers is remembered fondly by all those who had the pleasure of reading it as a child. Especially those of us who are lucky enough to have read it in it's heyday of the 70's and early 80's. It had a certain kind of charm, storylines were simple and not controversial back then. The miserable attempts by the writers in the late 80's and 90's to boost readership figures should be held in contempt for exactly what they were, soulless. It's unlikely that we'll see a new Roy of the Rovers strip nowadays. People who were fans have moved on, and that kind of stuff isn't as popular with children of today. Times have changed. 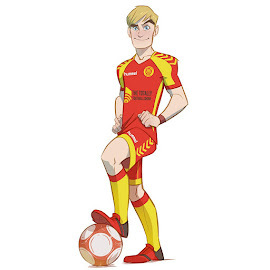 However, in early 2008 worldwide publishing firm Titan Books announced that they had bought the rights to the entire back catalogue of Roy of the Rovers comics. And they hope to have them on the shelves in graphic novel format for Christmas this year. If you know someone in their 30's or 40's, or even 50's who read the comic as a child, you could do a whole lot worse as a present for Christmas. But lets honour the greatest player to ever play (in a comic). Over his 55-year career, he won the league 10 times, the FA Cup 10 times, European Cup three times, Cup Winners Cup four times, UEFA Cup strangely only once, and the World Club Championships twice. He even managed England. He scored 436 goals for Melchester and is the record goal scorer in English football. The phrase "it's real Roy of the Rovers stuff" has even become a staple of any good commentator, especially when describing the unbelievable.